I can't tell you why Virtuix choose to use DirectInput instead of Xinput. VirZoom and from what I understand Katwalk is DirectInput also. I personally have no interest in keyboard mode. Analog controls are a requirment for a good experience. 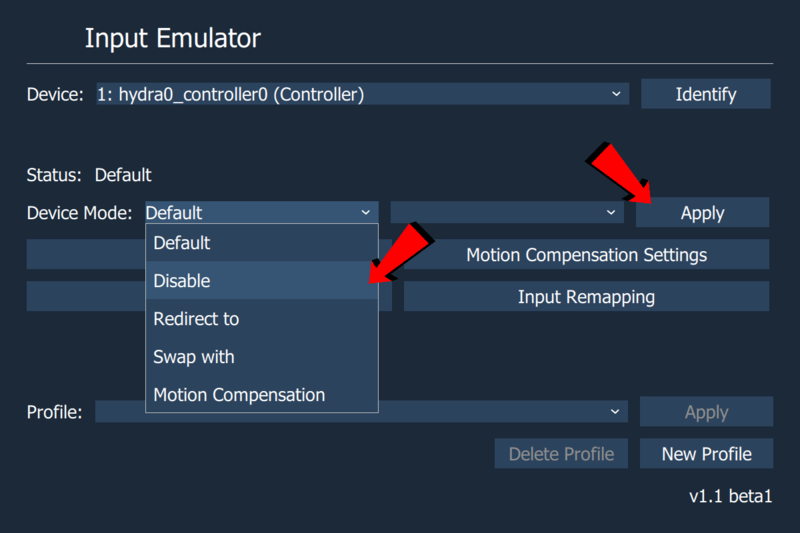 I don't know how much your able to do but it would be awesome if you could add a DirectInput controller option into the controller menu on OpenVR-InputEmulator which could then be remapped within VR. The program usually used for DirectInput to XInput is x360ce. FreePIE can also do DirectInput to Xinput emulation. Ok quick update on where I got, and to share info in case someone else is working in parallel. After that, there's a lib that we can build against or extend to do what we want to inject input, and the console project is a great sample for how to do that. That all being said, there's still a challenge....we need a listener for directinput that can capture the low level calls without a window...what this means is that if a game has 'focus', any input from direct input goes directly to that game...and not to our little listener that is trying to intercept it and translate it to what we want. I just built a demo using rawinput apis (the modern way to listen to directinput calls) however when it isn't in focus, it doesn't work (as expected due to what I said previously). However it seems that FreePie is doing this somehow...so I'll dig into that source next. It might still be sloppy, but the 'fix' may be to have freepie call directly into openinputemulator...we can make the install easier by bundling them together and scripting the install/setup. I may actually do that as a hack in the short term if I can get it done in the next few days. No promises though, this is going to be like peeling an onion...there's layers of problems to get past. Long term, I could see pulling the directinput listeners out of freepie, wrapping them against the lib in openinput emulator, and then having 2 steps: install openinputemulator to get the driver, then running our custom 'Omni to thumbstick' app. But we're several iterations from that at this point. I have to get some sleep, I'll try to keep at this. UPDATE: I think the conflict with some games not working with the Hydra driver is related to the Unreal engine. I got Killing Floor: Incursion today and of coarse it being an Unreal game it has the same issue. So I decided to disable the driver during launch and re-enable it after the controllers/hands were working in game. It was a success! I have not tried all the games that were on the not working list but I think they should all work now. Instructions updated with new method to play Unreal Engine games. As Robo Recall is an Unreal game I'm going to assume Oculus games running through Revive don't have this issue. Quick update from my end: Rawinput allows us to monitor 'gamepad' inputs from background tasks. This means I'm able to write an app that can be minimized, but listen to input from the Omni. I have that part working with a different gamepad, but not yet on the axis. Next up I'll start a project that listens for the axis (working from this sample: https://www.codeproject.com/articles/185522/using-the-raw-input-api-to-process-joystick-input) and combines that with the lib for doing the vr input emulation. As I think about this..what we really want is something that listens to gamepad input, and then translates that to either vive or occulus touch input...it's not really something that is Omni specific necessarily. Anyway still plugging away, and I want to document my progress in case another decides to jump in. Awesome Joe I look forward to seeing what you come up with. EVOL and Joe - I just wanted to say thank you for your work and dedication. I too am still waiting for my Omni. It has been an up and down ride for sure. The forum was a sad place. EVOL, you have brought life back to it. Joe, I’m glad you didn’t give up. You two have brought me hope again. You will need to start SteamVR one time. Maybe even open OpenVR-InputEmulator and create an empty profile first. Sorry didn't think about that before. oh wow you are here i was expecting an answer much later. Also to confirm this runs games in oculus rift as long as steam vr is turned on or run games bought only from stem vr for oculus rift? It runs only in SteamVR however with Revive you can run your Oculus Home games with an Oculus Rift/Touch through SteamVR. Yeah, the consumer Omni was dead in the water before this. Hopefully all the people who gave up on their Omni will find this before selling it off. I'm so glad I figured this out and happy to pass on the knowledge for others. I actually got that part, it says 6 since (L) oculus controller is designated as 6. My next question is when you said redo for the other controller you meant right controller with use of hydra right? Yes but it's probably not necessary for Oculus Touch. It's more for the ambidextrous Vive wands or if your left handed and you select to use the right hand controller for movement ingame options. As for the left/right hydra it doesn't matter they are both mapped to the Omni you don't need to map both only one. I got it working. Question the decoupling in omni does not work on this, i still move to where my face is pointed? You select in game either head direction or controller direction. The Omni doesn't send the ring information through joystick controls sadly. It works weird with pavlov. noticed that if i walk forward it goes forward, i walk back it goes back to go sideways kick your rigt foot towards right strafe move left foot towards left. Info purpoae, havent tried with other games. BTW thank you so much for this, i almost was disappointed with this omni because of no suport. Hmmm... I don't have Pavlov to test. I'm trying to understand your issue so are you saying that when you step left on the Omni you move right in game? its like it doest matter where i am facing. imagine a clock and you are in the middle, it doesnt matter where you face if i run forward i move towards 12 oclock, i swing my (R) foot (R) i move 3 oclock, if i run back i move 6 oclock, will do further test. So when you turn on the Omni you can't turn and run forward in a different direction in game? Lets say i started the game and i am facing forward that's my original 12, if i face 3 and run forward i move towards 12 bur is facing 3. if i am facing 12 and swing my foot towards 3 i move towards 3. Well that's strange I haven't came across anything like that in other games I've tested. Maybe some option in game can correct it. When you use the touchpad it works this same way? Maybe a 360 rotation option in game? You have the script running in FreePIE?